This is Elizabeth Adeney - Britain's oldest mother-to-be. At 66, she is four years older than the previous record holder. Mrs Adeney, who is around eight months pregnant, is believed to have undergone IVF abroad because most British clinics will not treat women over the age of 50. Friends say that the divorcee, a wealthy businesswoman who is still working a five-day week, is in perfect health and looking forward to the birth of what is thought to be her first child. But her pregnancy will reignite the debate over late motherhood and the ability of science to enable women in their 50s and 60s to become mothers. Mrs Adeney will be just short of her 80th birthday when her child becomes a teenager. A friend said she had been desperate to conceive for years. Last year, she travelled to the Ukraine, where a controversial IVF clinic has helped countless women get pregnant using donor eggs and sperm. The divorcee is expected to give birth by elective Caesarean 'I am a private person and while I appreciate there may be some publicity I will just ignore it,' she said. 'This has been a very personal decision and I do not feel I have to give interviews or talk to anyone in the media about what I have decided to do and where I have done it.' Mrs Adeney is divorced from Robert Adeney, a former chairman of upmarket riding and leather goods firm Swaine Adeney Brigg, which was founded in 1750. Like most older mothers-to-be, she is expected to give birth by elective Caesarean. She has hired a live-in nanny, who will help her to cope after the birth. A room in her £600,000 detached house in Lidgate, a picturesque village a few miles outside Newmarket, has already been converted into a nursery. The news of Mrs Adeney's pregnancy has led critics to question once more whether IVF should be given to women who are past the age where they could naturally conceive. The NHS will only consider women under the age of 40. One of the chief health risks to older mothers is pre-eclampsia, which can lead to blood clots and serious complications, or even death. However, the condition, which causes high blood pressure, can be detected by regular checks. Mrs Adeney is one of a growing number of older women who have sought IVF treatment abroad in the last few years. These include Patti Farrant, who was the previous oldest woman in Britain to give birth. 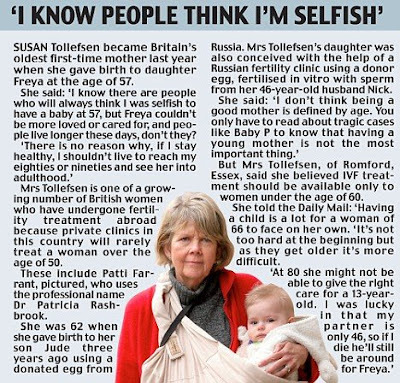 The psychiatrist, who uses the professional name Dr Patricia Rashbrook, was 62 when she had a son in 2006 using a donated egg from Russia. A shortage of women willing to donate eggs in Britain - where they cannot be paid - has also driven increasing numbers of younger childless couples into travelling for treatment. The Daily Mail has investigated the growing trade in 'fertility tourism' in countries such as the Ukraine. An undercover female reporter visited one of the best-known clinics, the Isida in Kiev, where women can receive IVF treatment for around £6,000. The 43-year-old was expecting 'a general chat' about IVF but instead the clinic's medical director, Victor Zinchenko, offered to start treatment straight away. Unlike clinics in Britain, the Isida does not impose an age limit for women who are prepared to use donor eggs. The clinic refused to say how much the egg donors were paid - it is thought to be a few hundred pounds - but simply said they were 'very well rewarded' for their trouble. Fertility experts in Britain have warned that donors in other countries are not always warned of the risks of egg donation, which can even cause infertility. The oldest woman in the world to give birth was 70-year-old Omkari Panwar from India, who had a twin boy and girl last year.